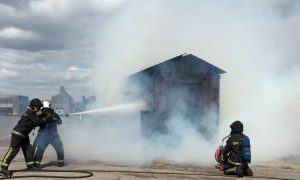 Angus Fire has maintained its position at the forefront of fire protection technology through continuous investment in research and development. This is carried out through an international network of laboratories and fire test facilities in the UK, France and the USA. The unique combination of technical expertise in rubber and textile technology (fire hose), speciality chemicals (foam concentrates) and engineering design (firefighting equipment) has enabled it to achieve numerous technological “firsts”. 2016 – CoolFire System, a rapid response, high efficiency firefighting. 2016 –Respondol ATF, a superior quality fluorine free foam. 2015 – JetFoam, the world’s first film forming fluorine-free foam for aviation. 2015 – AP800, a new light-weight and compact design portable pump. 2014 – Launch of Integrity Foams combining C6 and fluorine free foam concentrates. 2005 – Angus partner BP in the first large-scale LNG fire tests using realistic scenarios. 2002 – World’s first commercially available fluorine-free foam for class B fires, Syndura. 1999 – Niagara the first UL Listed high fluidity multipurpose foam concentrate. 1998 – Uniductor the first portable foam inductor designed to handle the different viscosity characteristics of standard and Alcohol Resistant foams. 1995 – Colossus, the first, mobile high capacity aspirating foam cannon. 1992 – Alcoseal 3-3, the first 3% multipurpose Alcohol Resistant FFFP foam concentrate. 1992 –Tankmaster , the first FluoroProtein foam specially developed for use on MTBE. 1987 – OM1 (now OM80), the first water turbine-powered oscillating monitor to be built. 1981 – Petroseal, the first Film-Forming FluoroProtein (FFFP) foam. 1971 – The first FluoroProtein foam concentrate, FP70. 1968 – AF120, the fully self-contained mobile foam unit. 1965 –Duraline; the world’s first maintenance-free covered fire hose.